The festive season is a time to play fashion. Dive into the world of ethnic outfits and make yourself look gorgeous for card parties or family get-togethers. We know you have gone crazy finding the trendy and latest outfit ideas online but didn't find any help. 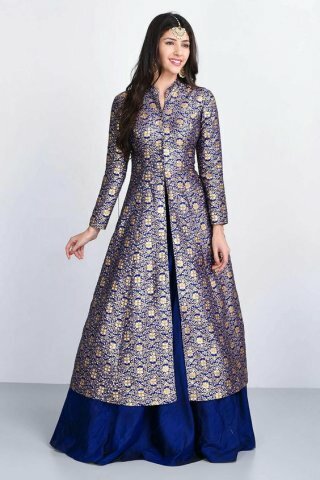 Here we have kurti and skirt design ideas that catch the attention in the middle of a crowd, this type of pattern comes with different style and colour. Get ReadyTo Grab Eyeballs Wherever You Go: 10 Lehenga Ki Designs That'll Make Temperatures Soar And Turn Your Into A Star! Kurti and a lehenga is a nice combination but you can go wrong with it if you do not match it properly. If you want to play safe, make sure that one of them is a solid colour. It is always wise to go for a solid colour lehenga if your kurti length is long. This is because if there is a print on the lehenga, it will hide due to the kurti. If you are choosing for a printed or embroidered lehenga, then opt for a solid colour kurti. Choose a short length kurti then. Try choosing a common colour like black, beige, red or white as it will match with your other ensembles as well. When choosing a solid colour kurti or lehenga, add some embroidery or borders on the hem to make it look dressy. However, if it is a normal party, then you can wear it plain as well. Choose the ensemble according to your occasion. Print on print is a trend which is evident in all types of ensembles from kurti-pants to palazzo pants-crop tops. It would equally look good with a lehenga as well. You can opt for dreamy floral prints or go for geometrical prints. The options in this arena are endless. Even traditional motifs would look good for a kurti and lehenga. You can also pair the same print in different colours if you feel you will be able to carry it. A combination of ikat print with modern designs would also look fantastic. Apart from that, focus on the occasion and then choose a print. You can opt for floral prints if it is a day function. This is because floral prints normally look good in pastel shades. Choose for dark and vibrant prints for the night function and decorate it with gold or silver borders. It is always a good idea to use 2-3 fabrics when opting to wear a kurti lehenga. You can go for a transparent fabric for the kurti and choose a blend of silk for the lehenga. 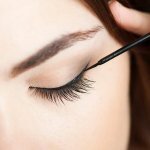 It will give a great effect and you can choose to avoid wearing a lining on your waist. Choosing a net lehenga with a silk kurti would look great. You can also add borders of velvet in the hem of the lehenga. If it is a marriage function, then opt for a heavy dupatta with the whole set. A lot of variations can be done when opting for a kurti lehenga. You can go for a full length straight cut kurti or choose a full-length A-line kurti. Both of them will give completely different looks to your outfit. If you want to give the effect of chaniya choli then, have a front cut to your kurti from the waist and show your stomach. Even the side cuts can start from a high waist. In this way, it will look different, stylish and trendy. Short length kurtis also look great with lehengas. In this way, you can add work in the lehenga too, as it would be visible. You can opt for angrakha or peplum style tops when choosing short lengths. If it is a formal function, then opt for a quarter or full sleeves. If it is a party, then you can go for a sleeveless or off-shoulder pattern. 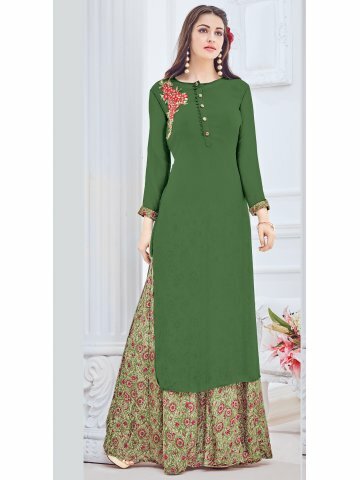 Beleza Dark Green Rayon Cotton Embroidered Lehenga Style Kurti from cilory.com is a great choice. The lehenga is printed and the kurti is plain. The lehenga not only contains print but also embroidery and stonework. The lehenga is green in colour and contains floral print. The flowers are highlighted with dark pink coloured stones and the leaves are embroidered. The lehenga is made out of rayon fabric and can be washed in the machine with a gentle cycle. 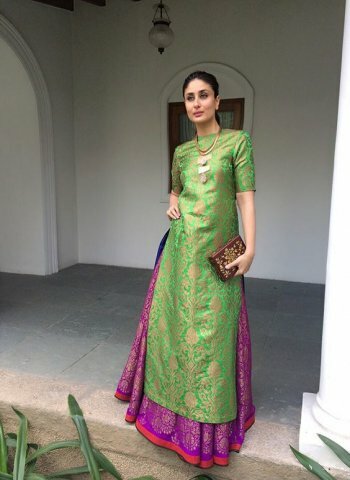 The kurti is green in colour and is 156 cm in length. It has a round neck with full sleeves. The kurti is made out of georgette fabric and its lining is made out of santoon fabric. The kurti also contains an embroidered motif near one of the shoulders. The motif is pink in colour and makes the outfit look dressy. It is advised not to bleach the outfit and also to wash it inside out. The piece is perfect to wear for a party and is priced at Rs.1,399. Ajio has some amazing patterns and you should sure check it out. One of the designs that we recommend is the Mid-Rise Floral Print Flared Lehenga. It is a print on print lehenga and is light green in colour. The set contains copper coloured floral motifs all over which make it look very dressy. The whole set is made out of cotton blended fabric. It is a pleated construction and the lehenga is flared with a concealed zipper on one side. It contains a sleeveless asymmetrical hemline kurti. It is embellished with stones which make it look really classy. The kurti is priced at Rs.1,400 and the lehenga is priced at Rs.1,750. You can never go wrong with a printed lehenga and a solid colour kurti. Vivid Dark Pink Kurta With Dark Grey Lehenga from cilory.com is exactly that. The kurti has a mandarin collar and is pink in colour. It has quarter sleeves and printed border on the hem of the sleeves. The kurti is made out cotton slub fabric and has buttons in the front. 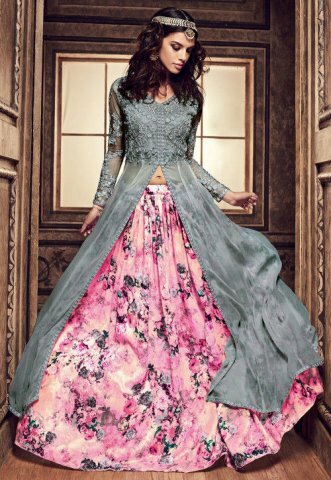 The lehenga is 109 cm in length and is grey in colour with abstract print. It also contains a pink coloured border on the hemline. The whole set can be washed in the machine with a gentle cycle and is advised to avoid using bleach by the brand. The set is perfect to wear for an evening party. It is priced at Rs.1,399. Red Straight Poly Cotton Kurti from biba.in is a wonderful piece which can be paired with a lehenga. It is a sleeveless kurti with straight cuts. It contains round neck with golden zari embroidery on the yoke. The kurti also contains buttoned placket. The kurti is short in length and can be paired with an off- white or black lehenga. The kurti is priced at Rs.799. 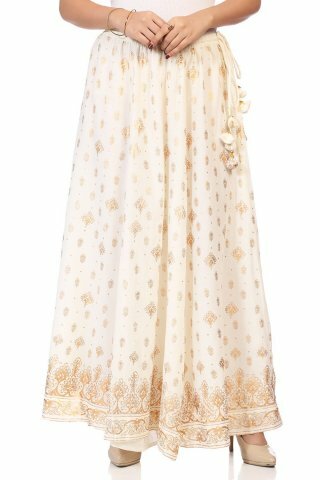 Off White Cotton Flared Skirts from biba.in is the perfect choice to pair with this kurti. The skirt is flared and thus, it gives an effect of wearing a lehenga. It has shimmery gold print all over which makes it look very dressy. The skirt also features latkans and tassels on one side. It is priced at Rs.1,599. It is a good idea to add a dupatta to your kurti lehenga ensemble. It will look dressy and formal and can be worn in a wedding event. Max Embroidered Printed Kurti with Flared Skirt & Dupatta from maxfashion.in is the perfect site to choose from. The whole set is made out of polyester fabric and is black in colour. It has a round neckline with full sleeves. The front yoke is fully embroidered and contains floral patterns. The kurti is also printed with golden motifs all over. The skirt is flared and contains small golden coloured motifs all over. Both skirt and kurti contain a border at the hemline which makes it look very heavy. The dupatta is printed with mini gold bootis and contains golden borders as well. The whole set is priced at Rs. 1,999. Wearing A-line or kalidar kurti on lehenga would look very formal and graceful. 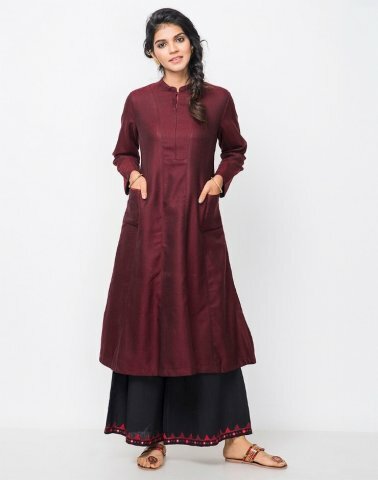 Maroon coloured long kurta from fabindia.com is a wonderful option. The kurta has Chinese collar and comes with full sleeves. The kurti is totally plain maroon in colour and gives a great look. The kalidar kurti almost looks like an anarkali kurti. The brand recommends dry cleaning and the kurti is priced at Rs.4,990. Pair this kurti with a Cotton Crinkle Gota Trim Long Skirt from fabindia.com. It is a regular fit skirt with crinkles. The skirt contains a gota trim hemline and has a drawstring closure. This look is totally plain and would look appropriate for a casual day at work. 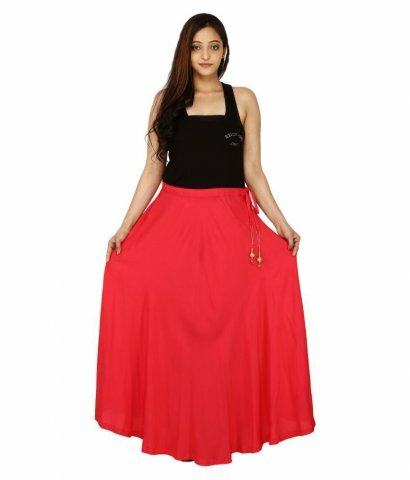 The skirt is priced at Rs.2,290. Ahalyaa Beige Chanderi Front Slit Kurti from snapdeal.com is a wonderful and trendy kurti. It is printed with floral motifs and is made out of chanderi fabric which is transparent. Hence, the kurti has a front cut which starts at the lower waist. The kurti has a boat neck and flared sleeves. The total length of the kurti is 50 inches and thus, it comes thill the ankle. 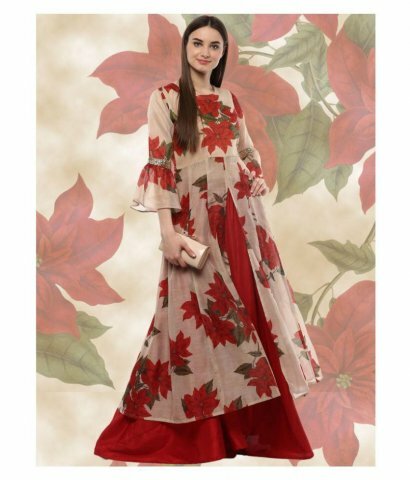 The base colour of the kurti is white and it contains big red coloured flower print on it. It is priced at Rs. 2,199. Pair this kurti with Chinmaya Rayon Circle Skirt from snapdeal.com. It is made out of rayon and has a regular fit. The kurti is as it is very long and is the highlight of this set and thus, a plain red lehenga would do. It is priced at Rs. 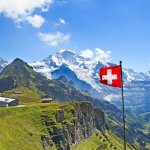 898. 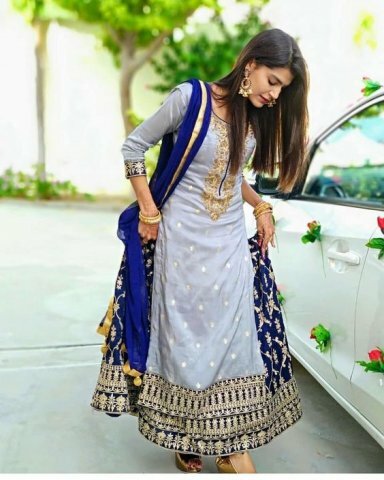 If you have to attend your best friend's or cousin's wedding, then Jacket Style Lehenga from utsavfashion.in is the perfect option. The dress is designed in such a way that it looks very dreamy and beautiful. The lehenga is printed with floral motifs and is pink in colour. It is made out of art silk fabric and contains poly shantoon lining. The lehenga is stitched circular and contains pleats near the waist for better fitting. The kurti contains only one front cut with full sleeves. The kurti is available in faux georgette and net fabric. It is grey in colour and contains resham work on the yoke which makes it look great and dressy. The resham work is extended on the sleeves as well. The kurti is available in semi stitched and stitched, both the ways. Pair the lehenga with gold earring and tiara. The whole set is priced at Rs. 6,221. This particular ensemble from shoppersstop.com is the perfect piece to wear during festival parties. 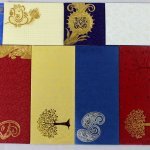 The whole set is specially tailored and made by the bran Ira Soleil. The fabric used is georgette. The kurti is light peach in colour and contains a front slit from the waist. It contains a chain in the front placket which makes the otherwise traditional kurti look cool and trendy. It has a round neck with full sleeves, which are printed with golden motifs. The hemline of the kurti contains borders of red, orange and gold. The lehenga is also light peach in colour and contains a border on the hemline. The waistband of the lehenga is golden in colour and is visible due to the transparent fabric of the kurti. The set comes with a georgette dupatta which is shaded with red and orange colour. It also contains small golden bootis. The whole set is priced at Rs. 2,516. 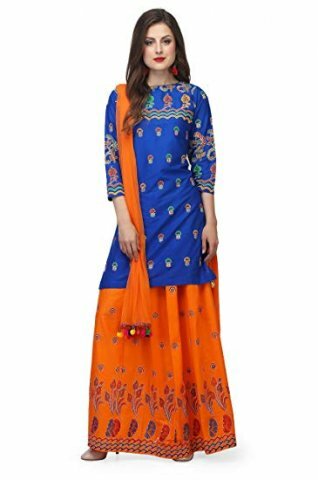 Be-Beu Cotton Lehenga Choli from amazon.com is a casual outfit. This piece can be worn to day functions in the temple or during garba nights. The kurti is royal blue in colour and contains a boat neck with quarter sleeves. The lehenga has a casual fit and is orange in colour. It contains floral and traditional motifs. Both, the kurti and lehenga are made out of cotton fabric. The set contains a georgette dupatta in orange colour. The dupatta contains a pom border on the edges. The manufacturer recommends dry cleaning or hand wash only. Pair this set with nice oxidised silver jewellery and you will look amazing. The set is priced at Rs. 1,360. Kurti is the latest fashion trends that make a heartfelt request to women of all taste and styles. Kurti as a dress can give you a serious fashion goal and also give you a new level of confidence. Wearing a lehenga kurta design is just precious and guarantees comfort and style. It is very important to go for the outfit made of good material that flatters your body shape. Wrong outfit material can break the final look of your attire and also yours. Many prints and embroidery don’t go well with all the materials and colours. Don’t get yourself an oversized tailored outfit as it can ruin your ethnic look. The tight-fitted dress is a big no as it will make you uncomfortable and also won’t look good.